As nice as it is to have a top-of-the-line razor with a silky-soft, replaceable razor head, some moments just call for a good disposable razor! But one must be very careful when choosing disposable razors because just because they share one thing in common–disposability–they are certainly not created equal! I have one rule when looking for disposables: Steer clear of one and two-blade razors! Using one or two-blade razors on my beautiful legs will quickly make it look like I went on a jog through a slaughterhouse. Okay, not that bad, but they’d definitely be dotted with bits of toilet paper! Painful, ugly, and unnecessary. So, when looking for a reliable disposable with at least three blades years ago, I came across the BIC Soleil. Razor reviews convinced me to give them a try for myself. Read on to learn all about them from my perspective! Small. I like that these are not bulky like a lot of the other razors that require cartridge replacements. There’s just something about how a skinnier razor fits in my hand when shaving and makes my shaving just a tad more comfortable. Shave in harder-to-reach places. Not only is the handle smaller, but so is the head which makes it much easier to get in and out of those lovely lady nooks and crannies! Okay, I just made our bikini lines and armpits sound like English muffins, but you get the point! Cheap. One thing that I just love about these razors is that they’re cheap! When I buy these, I know I’m not sacrificing quality in the name of a better price! I prefer for my razors to not be another bill in my house and these certainly fit the criteria! Disposable. Some people might see this as a disadvantage, but it depends on how you look at it. I, for one, enjoy having an entirely new piece to shave with rather than just replacing the head when it wears out. There’s been times when razor handles develop mildew which isn’t something I’d want up against my skin. Bring on the new razor! In a perfect world, we would all have a razor that is entirely perfect for us; no cuts, but leaves our legs would be left feeling softer than a baby’s bottom after each and every swipe. But when one removes their rosy glasses, they can find the flaws. Sharp. Okay, so this is definitely something that you want in a razor, but I only list this as a disadvantage because with having just three blades, it’s very easy to cut yourself! I’m not sure if it’s how the blades are angled or what, but definitely take your time using these until you really get a feel for them. Needs shaving cream. Although the blades are equipped with a pretty good lubricating strip, you still definitely need to use some sort of shaving cream or lots of soap to provide a nice, slippery surface for the blades to work their magic! Takes a few passes. This is usually a good indicator that it’s time to grab a new one. Sometimes you might have to go over the same area a couple of times in order not to miss some hair. Hair gets stuck. With it being such a skinny head, hair gets stuck in the blades much easier than a razor with a wide-open backing. Tapping out your razor in between each stroke ensures smooth operation. More waste. Many Earth-loving people will look the other way entirely when it comes to any disposable razor. I love my planet, but I also like having a fresh razor every couple of shaves. With disposable razors comes more waste in the landfills which is definitely a drawback. 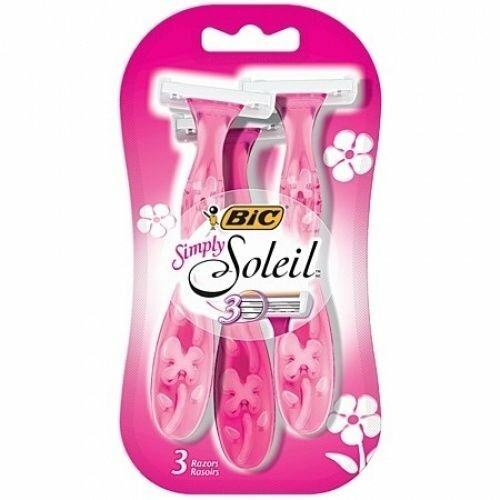 Would I recommend BIC Simply Soleil Disposable Razors? Quite honestly, this is the razor that has become my go-to when I need disposable razors. I’d say I use these disposable razors the majority of the time and when I feel fancy, I use the Gillette Venus Embrace razor instead. When you’re looking for a good disposable, I highly recommend these as they work quite well and won’t break the bank! Disposable or not, treat your legs well because although some razors are disposable, your legs are not! Some recommended products may use affiliate links. HairlyThere.com is a participant in the Amazon Services LLC Associates Program, an affiliate advertising program designed to provide a means for sites to earn advertising fees by advertising and linking to Amazon.com. Amazon and the Amazon logo are trademarks of Amazon.com, Inc or its affiliates.